My good friend Ken Whelan and I have teamed up again for 2016 to run a variety of fantastic fishing courses. These courses are aimed at beginners and improvers. There will be courses on salmon fishing, matching the hatch for river trout, and day/night fishing for seatrout. After the success of last years courses for trout and seatrout we are delighted to add the salmon course for 2016. (Click on any of the images below for more details). The venues for this year are really great. 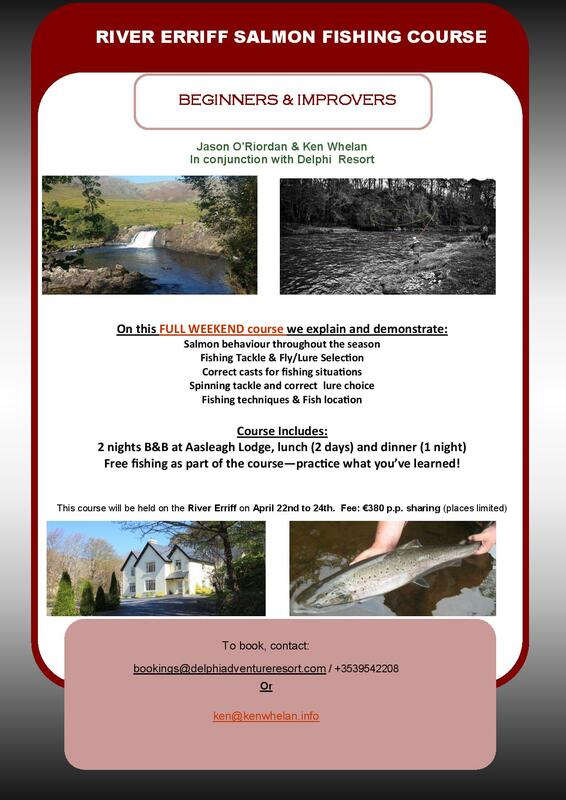 The Salmon course takes place over the course of a full weekend on the River Erriff (in conjunction with Delphi Resort) and there is some top class accommodation available as part of the whole package. Participants will stay at the wonderful Aashleagh lodge and meals are also included. 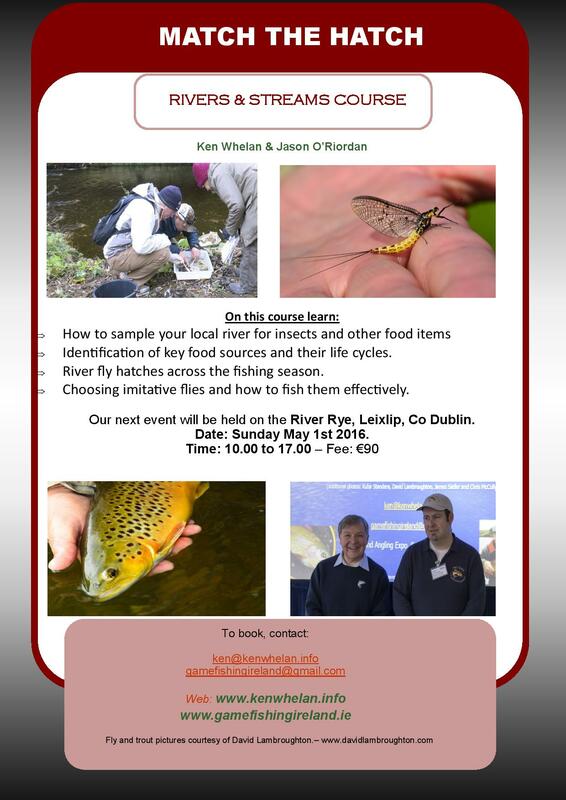 We had a lot of interest in the river trout match the hatch course last year and so this year we are holding the course in Leixlip on the River Rye. I always feel that this is a great value for money course for anyone into trout fly fishing. 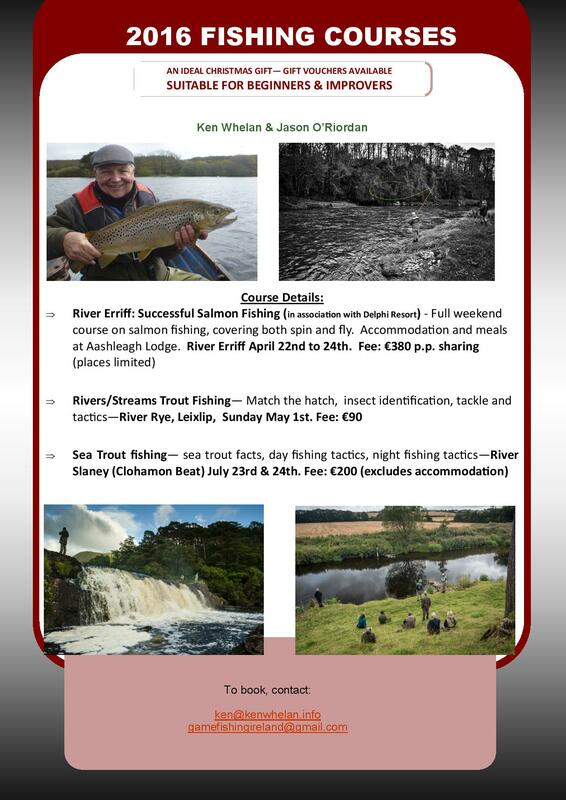 The feedback on our sea trout course last year was tremendous and we are delighted to once again have access to the famed Clohamon beat of the River Slayney. 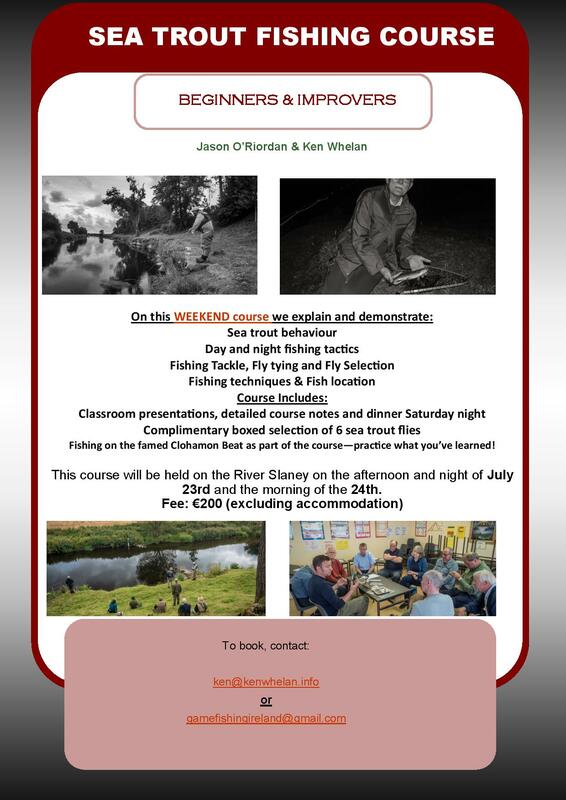 July should be a great time for sea trout and this course is unique in Ireland catering for both day time and night time sea trout fishing techniques. I have fished for these trout since I was a boy and Ken has written a book on the species! It’s going to be another cracker! This entry was posted in Uncategorized and tagged brown trout, Fishing, fishing course, flies, fly fishing, fly fishing course, fly fishing ireland, guiding, Ireland, ireland fly fishing, ireland salmon, irish fly fishing, irish salmon flies, salmon fishing, sea trout course, sea trout flies, Trout, wild brown trout by gamefishingireland. Bookmark the permalink.